Learn how snooze an alert, and how to use maintenance windows to prevent alerts from firing when systems are undergoing maintenance. To disable alert checking, you can snooze an alert. To disable alerts from firing for a set of sources or alerts during a custom time window you can create a maintenance window. You can snooze an alert so it doesn’t fire even if the condition is met. Wavefront allows you to snooze one or more alerts for 30 minutes, 1 hour, 6 hours, 1 day, 1 week, or Forever. If you choose Forever, the alert is snoozed until it is unsnoozed. Check the check boxes next to the desired alert(s). To snooze the alerts, click the Snooze dropdown, select the desired duration, and click OK.
To unsnooze the alerts, click Snooze > Unsnooze. Select Snooze > <Duration> at the far left of the alert to snooze it. Select Snooze > Unsnooze at the far left of the alert to unsnooze it. A maintenance window defines a time window when disruptive operations occur as a result of system maintenance or testing. During such operations, it’s likely that alerts will fire. You can create a maintenance window to prevent alerts from firing. You can close (end) maintenance windows early or you can make them longer. 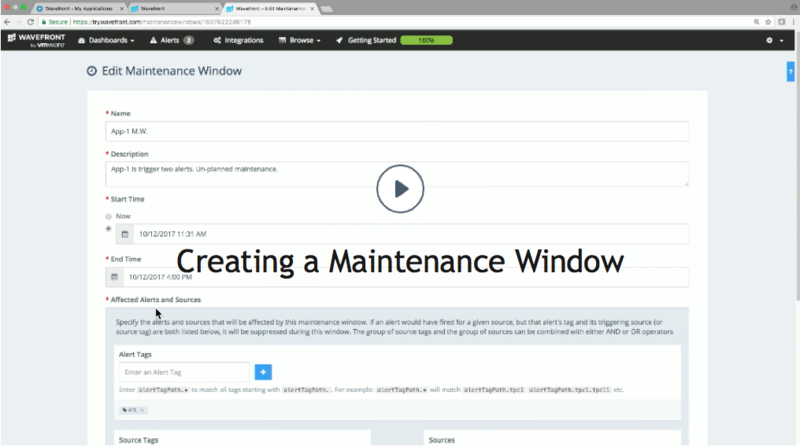 To view and manage maintenance windows, select Browse > Maintenance Windows. While every Wavefront user can view maintenance windows, you must have Alert Management permission to manage maintenance windows. If you do not have permission, the UI menu selections, buttons, and links you use to perform management tasks are not visible. Click Alerts or Browse > Maintenance Windows. Click the Create Maintenance Window button located at the top of the filter bar. Name The name of the maintenance window. Description Additional information about the maintenance window. Information entered into this field appears directly below the maintenance window in the Maintenance Windows browser. Now - The maintenance window starts immediately. - The maintenance window starts on the specified date and time. Click the text field and choose a date and time or type a date and time in the format MM/DD/YYYY HH:MM [AM|PM]. End Time The end time of the maintenance window. The end time must be after the start time. Click the text field and choose a date and time or type a date and time in the format MM/DD/YYYY HH:MM [AM|PM]. Affected Alerts and Sources The alerts and sources to suppress during the maintenance window. All alerts that have tags in the Alert Tags field are suppressed. An alert is suppressed if at least one of sources identified by the Source Tags and Sources fields causes the alert condition to be met. You must configure at least one alert tag, source, or source tag. Select Browse > Maintenance Windows. Check the checkboxes next to the maintenance windows. Click the Extend dropdown and select the desired duration or click the Close button. To extend the duration of a single maintenance window, select Extend > Duration. To close, edit, or delete a single maintenance window, select the three dots on the left and click Close, Edit, or Delete.